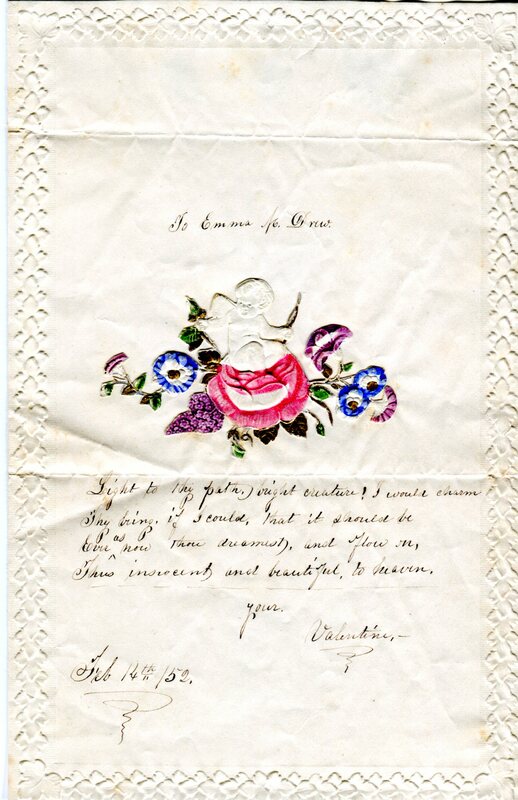 As tomorrow is Valentines day, it is the perfect time to highlight some of the lovely valentines in our collections. Sending messages of affection was not always done in the commercialized fashion of today. 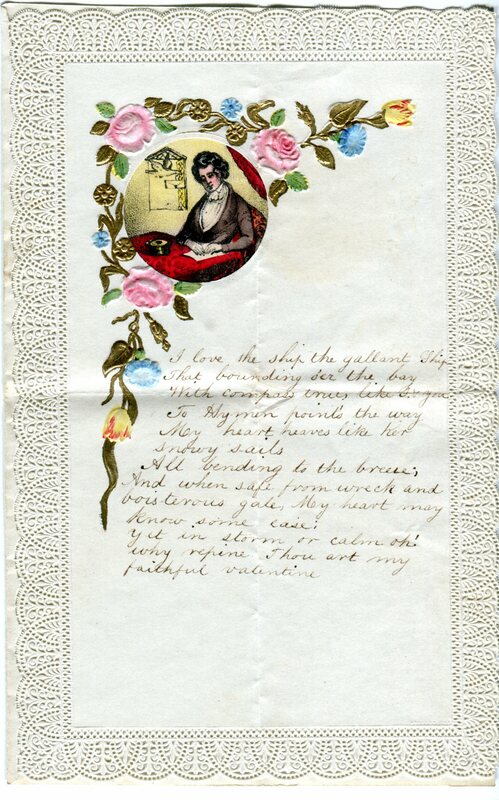 In the mid-19th century you were more likely to receive a hand illustrated missive with a heartfelt original poem. 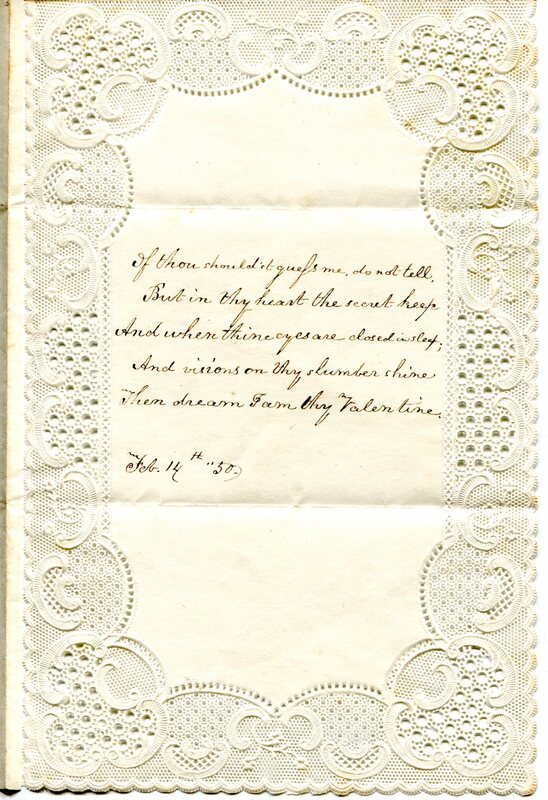 The delicate paper on which they were written often imitated intricate lace. These precious keepsakes could be treasured for a lifetime. 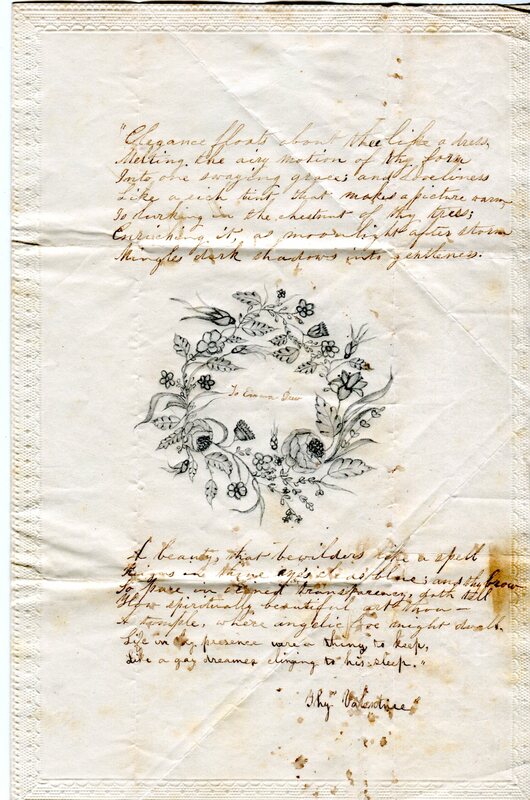 Emma Marinda Drew received a number of valentine messages while still a single young girl in Duxbury, MA. Emma was born in 1834, the daughter Capt. Joshua Drew and Marinda Wadsworth, and grew up in the lovely Federal-style house at 294 Washington Street. Her father was the captain of two of Ezra “King Caesar” Weston’s largest ships, the Oneco and Manteo. Her mother voyaged to sea with her husband at times and Emma may have accompanied them as a child. If thou should’st guess me, do not tell. Yet in storm or calm oh! 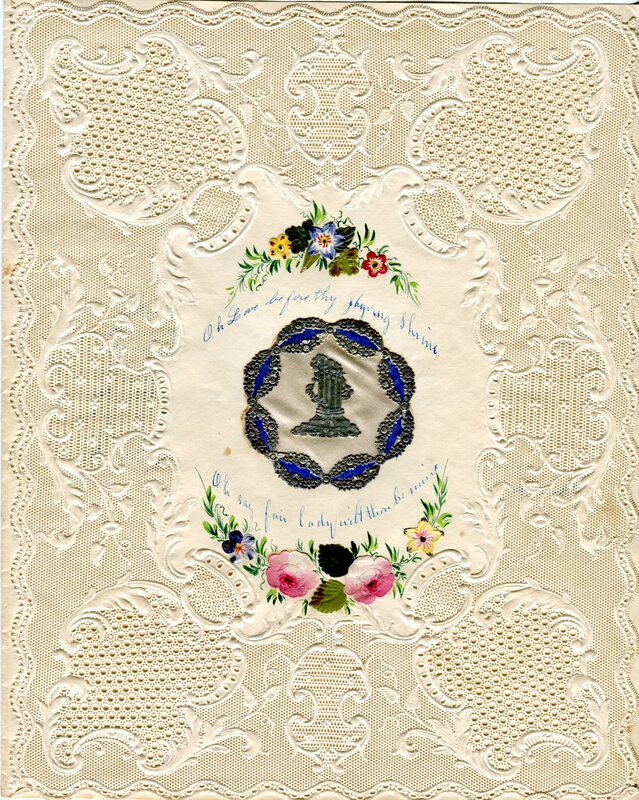 Emma married Lyman Drew, a musician and music teacher, on August 16, 1855. The couple had one child, Mary Lyman Drew, born in 1858. In 1881 Emma and Lyman purchased an old house at 152 Marshall Street in the Standish Shore area of town. The house was perfectly situated to be an attractive boarding house and indeed it became a popular destination. It was close to the beach and the Myles Standish Hotel and a only short walk from the recently erected (although not completed until 1898) Myles Standish Monument. Emma became a widow in 1887 when Lyman died but she continued to run the boarding house until 1907. She then became a boarder herself, moving to the home an acquaintance on Chestnut Street. Emma M. Drew died in 1913 at the age of 79.